Filtration is commonly the mechanical or physical operation which is used for the separation of solids from fluids (liquids or gases) by interposing a medium through which only the fluid can pass. The fluid that passes through is called the filtrate Diagram of simple filtration: oversize particles in thefeed cannot pass through the lattice structure of the filter, while fluid and small particles pass through, becoming filtrate. 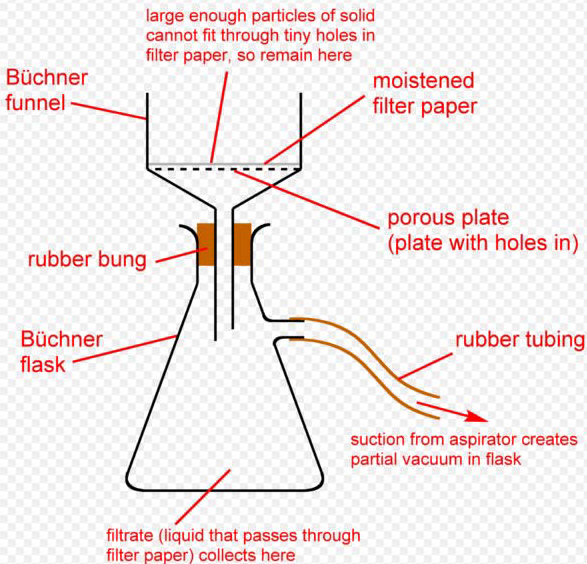 Suction filtration is a chemistry laboratory technique which allows for a greater rate of filtration. Whereas in normal filtration gravity provides the force which draws the liquid through the filter paper, in suction filtration a pressure gradient performs this function. This has the advantage of offering a variable rate depending on the strength of the pump being used to extract air from the Büchner flask. Care must be taken not to use such a strong vacuum that the filter paper rips (in which case all the solid will be lost back into the solvent) or in extreme cases the glass flask breaks. Vacuum Filtration System for general filtration in lab.